As busy moms sometimes it is hard to find the time to prepare healthy meals for our families. Healthy Moms wants to stress how important it is to make time to not only eat dinner as a family but also prepare delicious healthy meals to help your kids grow big and strong. General Mill’s and Eat Better America is also encouraging families to live a healthier lifestyle by choosing nutritious food for mealtime and snacking. 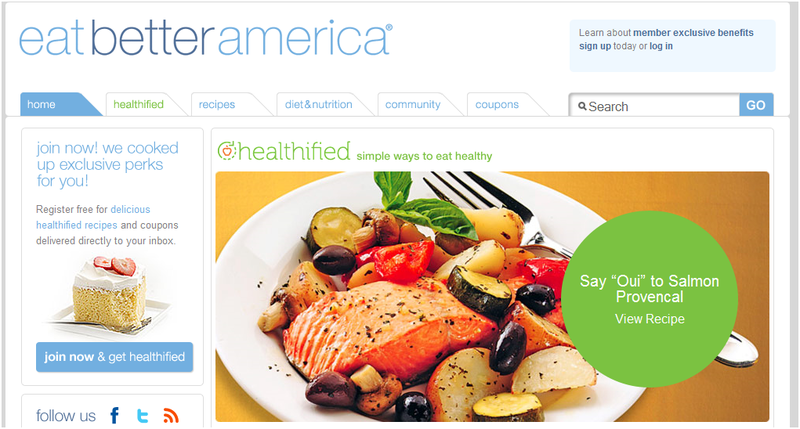 Visit Eat Better America and sign the pledge to “healthify your dinner” for a chance to win $1,500 in free groceries. The Eat Better America website also offers information on nutrition, healthy recipes, and printable coupons for General Mill’s products. 1. Wash and slice up fresh fruit and veggies ahead of time and place in plastic freezer bags. You can store them in your freezer or refrigerator to use later. 2. Prepare main courses for the week ahead of time and freeze. Before leaving in the morning pull it out of the freezer to defrost then you can pop it in the oven upon your return. 3. Plan ahead! Make a list of the meals that you want to prepare for the week along with the recipes. Do your grocery shopping based upon those recipes. 4. Replace packaged snacks with healthier alternatives such as unsalted mixed nuts, seeds, cut up fresh veggies, and fresh or dried fruits. 5. Organize your refrigerator so that the items you will need to prepare dinner are in front and in a easy convenient place. General Mill’s wants to help you and your family to eat better by offering one lucky Healthy Moms reader a $25 gift card for groceries at their local grocery store. Required for entry: You must be a US resident 18 or older in order to enter. First visit Eat Better America on Facebook and become a fan or Follow Eat Better America on Twitter. Then enter the Eat Better America Sweepstakes for a chance to win $1,500 in groceries. To win the $25 gift card leave us a comment with your tip on how you get your family to eat healthier. The giveaway ends on May 31, 2010. For every entry including extra entries please leave a separate comment. Winners will be chosen randomly from the comments and e mails that I receive. The contest ends on May 31, 2010 at midnight PST. *Disclosure in exchange for writing this General Mills is providing the $25 grocery gift card to one Healthy Moms reader. All opinions are truthful and 100% mine. I'm a FB fan of Eat Better America (Margaret E. Smith) and I Follow Eat Better America on Twitter (peg42). I entered the Eat Better America Sweepstakes. My pledge/tip is to have healthier options of food available in our home for my family. More fruits, more veggies and less unhealthy snacks. I pledged to reduce the fat and salt in my family's diet. Im a FB fan. We make it a family outing and go to the Farmers market to find healthy things to eat and snack on. I am adding more fruits and veggies to our diet. I buy my family more whole grains to eat healthier. I stopped buying sodas and junk food and have more fruits and vegetables on hand. i get my family to eat healthier by providing lots of fruits for snacks! Joined the pledge for the sweeps. And I am actually currently trying to get my kids to eat more fruit and veg!! I try to make things with olive oil or coconut oil so we eat healthier. Luv to win. Thx much. I'm trying to keep only healthy food in the house, and we're cooking way more. Thanks! To eat better though here, we disposed of the frying oil and put the deep fryer in storage. I get my family to eat better by filling the cupboards with healthy options. They can't eat a bunch of junk if it isn't there. I visited on facebook, follow on twitter and entered the contest! They eat what I fix, so the burden lies with me to make healthy, tasty meals. It's not as hard as people make it out to be, really. Healthy food just tastes better once you get the processed junk out of your system, your body doesn't miss it. I am a fb fan of Eat Better America. I think healthy eating starts at the grocery store. I buy only healthy items so I'm not tempted by bad choices. If it's not in the house, you can't eat it! Water. We drink tons of water. If you have some right before a meal you don't eat as much and it keeps you full throughout the day. I make sure that what's in the fridge and in the pantry is healthy: yogurt, fruit, raw veggies and hummus, low fat cheeses, various kinds of nuts, and dried fruits. If the junk's not there, they'll choose something healthy. I try not to keep too many sweets in the house. I follow on twitter and a fan on facebook….entered the pledge. My tip is to replace slowly all the white bread and pasta with whole grains. a FB fan of Eat Better America and idahomom7 follows Eat Better America on Twitter. I entered the Eat Better America Sweepstakes. My tip is that my kids will eat anything with pasta, so I add the vegetables to the pasta. We let the kids pick out new fruits when we go shopping so eating healthy is a little more fun for them. Getting whole grain items is an easy and painless way to do so. I try to make our main meals healthy by serving fresh fruit & veggies. We eat healthier because I minimize the processed food I bring into the house, and make sure healthy snacks are ready and available. We eat healthier by having more healthy fruit and vegetable options, expecially in the summer months when it is so plentiful. I follow Eat Better on Twitter (auntiethesis) and I'm an Eat Better FB fan (Michelle Hudak) and I entered their sweepstakes. I always buy fruit and veggies for the kids to snack on and I make it easy since I cut it up and put it in easy open containers in the fridge so they can grab and go when they're hungry. My tip on how to get my family to eat healthier is to only bring in the house foods that have nutritional benefit to you. If it is the only thing in the refrigerator or cabinets it is what kids will eat when they are hungry. To stay healthy, I avoid processed foods, and visit our local farmer's market 2x a week. I visited Eat Better America on Facebook and become a fan. I entered the Eat Better America Sweepstakes for a chance to win $1,500 in groceries. I sneak healthy food into our meals. I add beans for fiber in casseroles, use whole wheat pasta, and put shredded zucchini in EVERYTHING. I am pledging to eat more fruits and vegetables rather than unhealthy snacks and foods! We eat a lot of fresh fruit. Im a fan on FB, and I entered the contest. i follow Eat Better America on twitter – js22222222 . I try to have healthier snacks like fruits and cut up veggies available to snack on instead of crackers and chips. Following and LIKE Eat Better America. Entered their contest too! I think there's a Fiber Revelution going on. I help the family by cooking with foods rich in fiber and whole grains! Subscribed to the Healthy Living e-mail newsletter! I keep a cheese, yogurt and fruits around the house for my children to eat. Fan of Eat Better America on Facebook (SusanBenegas)and I Follow Eat Better America on Twitter (susitravl). I entered the Eat Better America Sweepstakes. So glad summer is here so we can eat healthier by grilling our meat/chicken/fish and eating more fresh fruits and veggies. I am a facebook fan..
we chop up fruits and veggies on Sundays for the entire week, so we just grab a container and go! My daughter decided to go vegetarian. To simplify dinnertime, I am now serving more meals gearsd towards her. Facebook Fan of Eat Better America-charity s.
I entered the Eat Better America Sweepstakes. We are limiting our salt intake, and I'm grilling instead of frying foods. I keep cut up veggies and fruits ready in the fridge so that they are handy for snacking. I get my family to eat together by serving pasta. We eat healthier when we purchase healthier ingredients so we make those plentiful and abundant! Thanks for the giveaway…we serve a selection of fruit / vegetables with all our meals, so the kids have no excuse that they don't like a certain item because there is always another choice !!! I buy more fruits and vegetables so my family eats healthier. I follow Eat Better America on Facebook (Betty Curran) and on twitter as willitara. I also entered the sweepstakes. I keep plenty of fresh fruit and vegetables handy for snacking and try to keep unhealthy snacks out of the house completely. I'm follow on twitter as willitara. I try to shop smarter at the grocery store and only bring home healthy foods. We can only eat what I've stocked in the house, so if I buy fruits and veggies and whole grains, that's what we all eat.